Bangkok (Thailand) – September 25, 2018 (travelindex.com) – The family tree starts with Constantino Urbani in 1852, when he began exporting fresh truffles to Carpentras, France, thus creating a business that has become increasingly larger and more relevant through the years. Exports quickly expanded to France, Germany, Switzerland and at the same time as other Italian regions. The Urbani family have faithfully dedicated themselves to providing top-notch truffles to treasured patrons. For more than 160 years the Urbani family’s service in the truffle industry has gone unparalleled by any other in its sector. So much so that 70% of all truffles sold in the world come under the Urbani name. Urbani Truffle Bar & Restaurant present the most outstanding Italian fine dining with a spectacular view over the heart of Bangkok. View and quality describe Urbani Truffle Bar & Restaurant. Urbani Truffle Bar & Restaurant serve the valued customers by luxury services. The Restaurant area inspired by the elegant Italian style, sophisticated by stylish fine dining and decorated by vintage made in Italy furniture and the restaurant area occupied by up to 80 seats. Urbani Truffle Bar & Restaurant welcome its honorable very important guests to the exclusive VIP room with customized services, and tastefully furnished by 20 seats. Urbani Truffle Bar & Restaurant’s cocktail lounge is an upscale bar with delighted food tasting menu. It is a truly enjoyable experience at the spacious lounge bar with unique high-end wine collection that characterized by the span and complexity of its offering. Urbani Truffle Bar & Restaurant is specialized in combining the Italian original cuisine with artistic fine dining of uniqueness and exclusivity and offers superior quality food with the element of uniqueness and exclusivity. The truffle-based dishes are simply excellent and obviously food menu is the culinary art of fine food. What makes Urbani Truffle Bar & Restaurant’s cuisine unique and special is the fabulous Italian truffles that thanks to Urbani family directly imported from Italy. 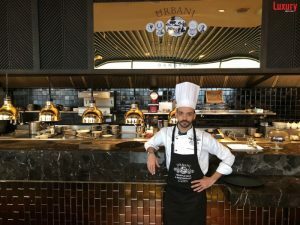 This concept Urbani Truffle Bar & Restaurant and Roberto Ugolini planned to expand in the next 2-3 years , in 20 different cities in the world, we are glad to consider any investor who love to have their own Urbani Truffle Bar & Restaurant, in franchise.